Which MLB team should replace the Cubs in the 'Rookie of the Year' remake? Which MLB team should replace the Cubs in the ‘Rookie of the Year’ remake? On one hand, I can’t imagine there are too many people out there who have been clamoring for a remake of the 1993 baseball film Rookie of the Year. But then again, we live in the age of the remake and reboots so all things must pass and a remake of the film is under development at Fox, per Deadline. In a way, it’s actually a good film to remake. Plenty of people of a certain generation remember Rookie of the Year but you’d be hardpressed to find too many people who adore it. This isn’t going to be a Star Wars of Ghostbusters situation with weird adults crying that their childhoods have been ruined because Henry Rowengartner is now African-American or whatever. It’s the kind of inoffensive 90s movie that you can simply make a new version of and no one is going to kick up a fuss because, well, whatever. It’s Rookie of the Year. Remake Little Big League and Angels in the Outfield too while you’re at it. However, there is one aspect of the remake that we’re going to have to sort out. See, in the original film, it makes sense that the Chicago Cubs are the team of choice. At the time, the Cubs were still the lovable losers of Major League Baseball. They hadn’t won a World Series in decades and didn’t seem all that likely to pull it off anytime soon either. Making them the hard-luck team that finds success on the arm of a pre-teen fits the narrative logic you need. The only way the Chicago Cubs will ever win a World Series is because of magic. Of course, nowadays, that’s not true. The Cubs won their World Series and are perennially one of the best teams in the league. Putting a child superstar with otherworldly pitching ability on their roster would just make the rich richer. In fact, most of the usual suspects from that era no longer work. The Boston Red Sox are arguably the most successful MLB franchise of the past decade. The Los Angeles Angels are perennial playoff contenders with some of the best players in the league. Even the Cleveland Indians, featured in the Major League movies, have been to a few World Series since then. So if we’re going to make a Rookie of the Year for the modern era, we need a hapless baseball franchise that makes sense for right now. Here, in our opinion, are the best options. If you want New Henry to save the very worst franchise possible, you likely won’t find a team in more need than the Mariners. Sure they put together an okay 2018 season but their futility knows no equal when you look at the past few decades. Not only have they never appeared in a World Series (one of only two current franchises in that spot), they are currently the owners of the longest playoff drought in professional American sports. It has been 17 years since Seattle last played in the postseason and you might remember that the year the Mariners won 116 games and then crapped out in the ALCS. Seattle needs a spark and they would absolutely find that in the arrival of a 13-year-old with a rocket arm. You think the people of Seattle are going to be picky about the legalities of that if he’s able to put them in the postseason? The Mariners are hapless but the San Diego Padres would like to make their own case for why they’re hapless-er. The franchise is coming off a truly dreadful season which ranks as one of the worst statistical performances in team history. That’s saying something because of the Padres’ history. They too have never won a World Series (they’ve been around since 1969, mind you). They haven’t won a playoff series since 1998 and they haven’t even sniffed the playoffs since 2006. Even when they do make the playoffs it’s depressing. The 2005 Padres made it with a record of 82-80. Another stat that really stands out is that they’re the only MLB team to never throw a no-hitter. If you’re looking for an extra angle for our New Henry, that’s got to be it. Trust us, at this point, Padres fans will take it. Hell, they might even put a statue of the actor next to Tony Gwynn’s. If you need the remake to include a team from the NL Central for some strange reason and you can’t use the Cubs again, you might as well go with the Pittsburgh Pirates. It’s true that the Pirates have had recent success. They made the playoffs for three consecutive seasons between 2013 and 2015. However, they also got booted right out in the NLDS each time as well. In the 20 years prior to that run, they were dreadful, putting up losing records in every single one of those seasons (a baseball record). They didn’t do that bad this season but it’s unlikely they’re going to dominate baseball anytime soon thanks to their small market status. If a superhuman kid with a magic arm should go anywhere, it might be here. If only because you can have one of the climactic games be the Pirates defeating the Cubs to win the division. 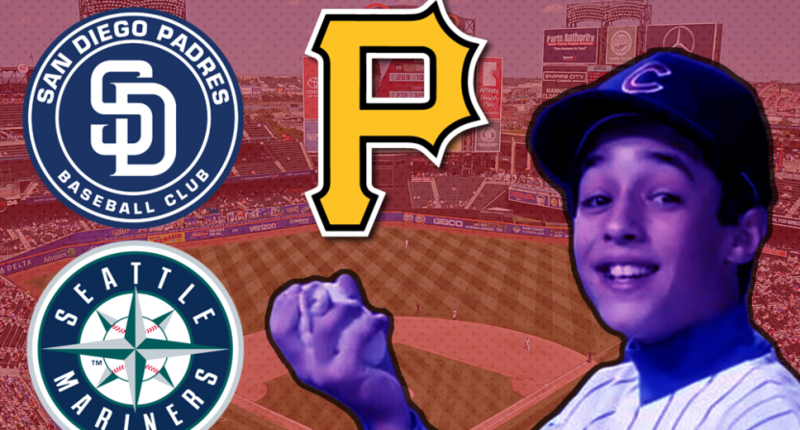 Now, the Mets aren’t as snakebitten as the Mariners or Padres. However, they are a pretty cursed and wretched franchise (I say this as a fan) who also have to live in the shadow of the New York Yankees, a shadow they will never emerge from. The Mets are a Shakespearean tragedy that unfolds over 162 games every season. And in that sense, they might be ideal to be the team of choice here. They’ve got built-in villains to conquer in their own division (The Braves) and in the World Series (The Yankees). We already expect to see them play terrible baseball, so the first half of the movie where we see the Mets plays terrible baseball will ring very true. Plus, you could weave some reality into the story by having New Henry play for the Mets, have the fans worship him, then have the fans turn on him, then have the team mishandle him when he gets injured, and then it all culminates in New Henry’s forced retirement which the Mets botch as well. Too real? Speaking of built-in narratives, the Baltimore Orioles come with a complete three-act structure ready to roll. They’re not one of the worst franchises of all-time but their recent history hasn’t exactly been a fun ride for fans. They’ve only made the playoffs three times in the past 20 years and only made it to the ALCS once. They begin every season playing from behind as the mighty Red Sox and Yankees duke it out ahead of them for world dominance. So here comes this magical kid from the streets of Baltimore, he turns the Orioles into winners, they sneak past the behemoths to make the playoffs and then beat the Yankees in the ALCS to make their first World Series since 1983. You could almost stop the movie right there and have your happy ending. Don’t risk it in the World Series. Just give Baltimore fans something to smile about and leave it at that.